These luscious cookie bars have a rich, butter shortbread crust with a sweet-tart lemony filling topped with a snow-fall of powdered sugar. For Crust: Blend together butter and sugar at medium speed of electric mixer. Stir in flour until incorporated and dough is crumbly. Press dough onto bottom of 8-inch square baking pan. Bake at 350°F (175°C) for 10 minutes. For Filling: Combine granulated sugar, cornstarch and baking powder. Beat eggs until frothy; blend in sugar mixture, juice and rind. Pour over hot crust. Bake at 350°F (175°C) for 25 minutes or until lightly browned and center is set. Cool; generously dust with powdered sugar. 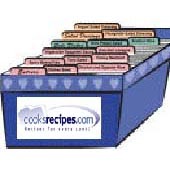 Adapted recipe courtesy of Wisconsin Milk Marketing Board, Inc.